This custom Scare-Glow popped up on eBay. 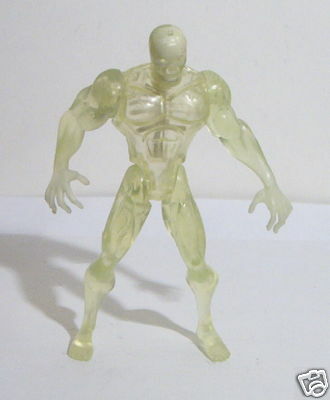 While it’s not bad, I’m really hoping Scare-Glow ends up being an SDCC exclusive molded in clear plastic with a glow-in-the-dark skeleton inside, similar to Blight from the Batman Beyond line. That's a fantastic idea. Unfortunately, there's no way Mattel is going to spend the money to tool a figure like that, while simultaneously selling it as a lower-run exclusive. Mattel likes to go around with it's hat in it's hand and complain about how much it costs to make a unique figure. Yeah, tell that to NECA.